How many of us remember our First Grade? Luckily, I have newspaper clippings, report cards, and letters. I decided to post a photo and text from the Winfield Park (NJ) annual school report. The school is gone. Destroyed in a fire years ago. Where am I in the photo? I’m in the second row from the top – bows and braids atop my head. I’m standing next to Carol Simon. The cute kid behind me is Robert Peters. Marie Lupo is in front of me. I loved school and, amazingly, I remember the names of so many kids. How exciting First Grade has been. At first we studied about the dairy farm. We made a large frieze with cows, chickens, ducks, and other farm animals. One day we visited the Walker-Gordon farm. We saw real baby calves and big cows. Miss Pietrowski and Mrs. Lulic ( Mary, my mother) took pictures of us at the farm. We enjoyed very nice parties at Halloween, Christmas, Valentine’s Day, and Easter. Miss Holton helped us make Jell-O for one of our parties. Playing in our grocery store was fun, too! Our own churned butter made a big hit and was pictured in the Newark News. We had real cans, all kinds of groceries, a register for money, and a telephone in our store. Each day two children were storekeepers. In March we studied about the wind and airplanes. Our kites and windmills were very gay. In April, we took a trip to the Newark Airport. It was thrilling to see the big airplanes land and take off. Spring came and we studied about the circus and the zoo. Our frieze of lions, monkeys, tigers, and giraffes made our room look like a real zoo. Our best trip was to the Bronx Zoo. We talked about this trip for days and days. Then along came the great day for our May Festival. Will you ever forget our Tom Thumb Wedding with Miss Pietrowski’s First Grade? It’s been lots of fun this year! We hope that Second Grade will be just as exciting next September. This was the very first year we attended school both in the morning and in the afternoon. This was the first year we became such good actors and actresses. Just read on and you shall see what many different roles we played. First of all, we were farmers who took good care of their farm animals. And since we like farms so much we went all the way down to the Walker and Gordon Milk Farm to see the cows and calves as well as the Rotolactor machine. Next we were Indians who lived in wigwams and beat upon tom-toms. We made feather headdresses and painted our faces for our program. Right before Christmas we decided to stop acting for awhile and be as good as we could –for Santa Claus was coming. Santa was very good to us and so we decided to resume our acting. This time we were Eskimos who made igloos and loved the Northern Lights. Last of all we were animal keepers at the zoo. We got to know all these strange animals quite well, especially when we visited the Bronx Zoo. For the May Festival we helped Miss Beck’s first grade with a Tom Thumb Wedding but no one really got married. Actors and actresses must be kept busy. We learned to read, to write, to count, and to work together cooperatively. We are really very good at our play-acting and since school must go on, we are ready now for Second Grade. If all self-published book authors were to stand in a line, our numbers might extend from Los Angeles to New York City, or at least to Jersey City. A few days ago, I saw my book in print for the first time. Happiness is seeing a book that went from an idea to pages of text bound between two covers. I opted to work with AlphaGraphics, a locally-owned, full-service print shop. The arrangement met my every need as a newcomer to self-publishing. The development phase is complete and an another challege begins. Who will read A Snowball’s Chance? The stories will interest high school students at risk of dropping out, parents, teachers, adult education instructors, guidance and drug counselors, school administrators, probation and correction officers, judges, and anyone willing to guide a student toward a bright future. 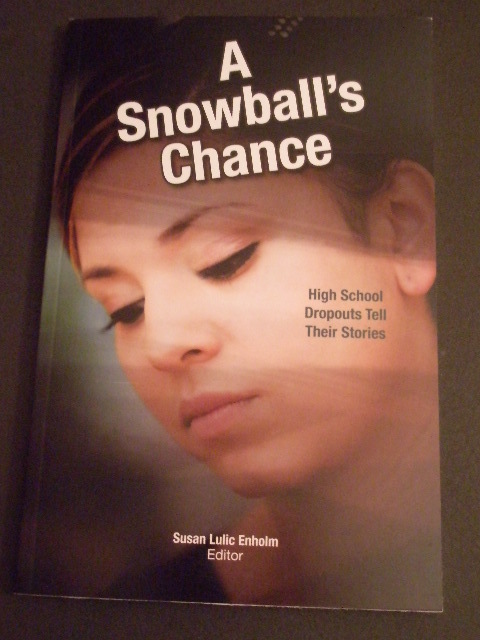 To read a book review, please go to: http://tucsoncitizen.com/community/2013/05/17/a-snowballs-chance-high-school-dropouts-stories-book-review/ If the link does not connect, please do Copy and Paste.